It was a rather cool and overcast day when I noticed this Yellow-headed Blackbird perched in some reeds at a pond in rural Norman co. Mn… Seemed to make the day a little brighter. 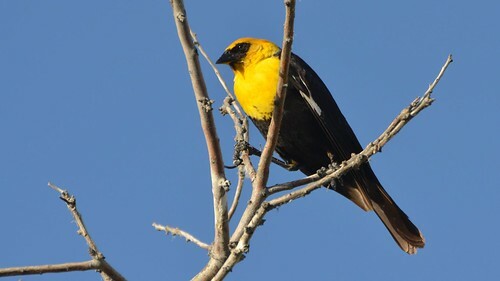 The Yellow-headed Blackbird (xanthocephalus xanthocephalus) is a North American bird and forages in the marsh, in fields or on the ground; they sometimes catch insects in flight. They mainly eat seeds and insects. Their main method of foraging is to push their bill into the ground or a food item and then force their bill, as well as the substrate, open. Outside of the nesting period, they often feed in flocks, often with other blackbirds. This bird's song resembles the grating of a rusty hinge. During the summer, this bird migrates north to the west-central portions of Canada and the United States. During the winter, it can be found from California to Texas as well as in Mexico and casually in Costa Rica. Xanthocephalus is een geslacht van zangvogels uit de familie troepialen (Icteridae). 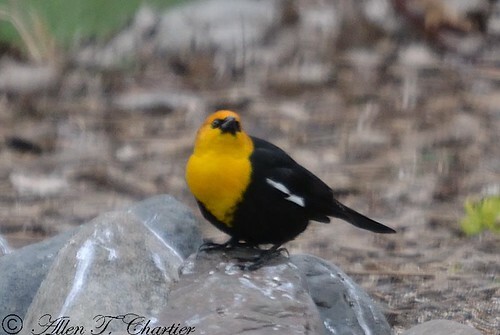 A male yellow-headed blackbird singing at Elizabeth Lake, British Columbia. The longer clip shows in the background how much bird activity there is at the lake. It is a special place to view birds and other wildlife. 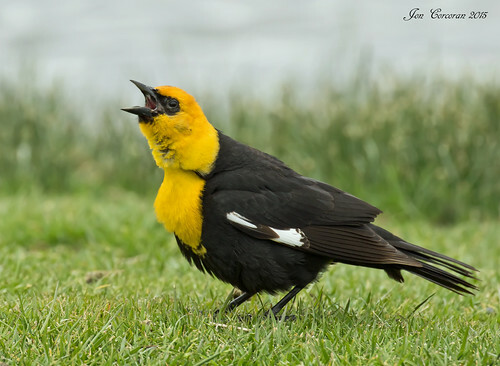 The call of the yellow-headed blackbird has been described as sounding like the grating of a rusty hinge! Photographed at Turtle River State Park, North Dakota (26 June 2009). Photographed at the Kellys Slough NWR, North Dakota (04 May 2012). He was a bit too far off for my lens that day and the was too much water between to get any closer.